Anyone able to give me a Materials List for the Current Free Plan of a Zulu ET? Not having built from a plan before I do not have a 'Scrap' Box. One of the arts of aeromodelling is estimating the materials needed and choosing the right grade for each component. Estimating is done by looking at each component, measuring and adding up and then doubling to allow for 2 sides 2 wing halves etc. Plus a bit for wastage. Sometimes as in this case 48 inch lengths are much more economical, also 4 inch sheets. Most balsa suppliers still use imperial rather than metric for balsa. So to help you I have looked at the plan ( even though I have no intention of building this! ) and given my idea of what I would order. I always use The Balsa Cabin for my supplies and I fully recomend them. 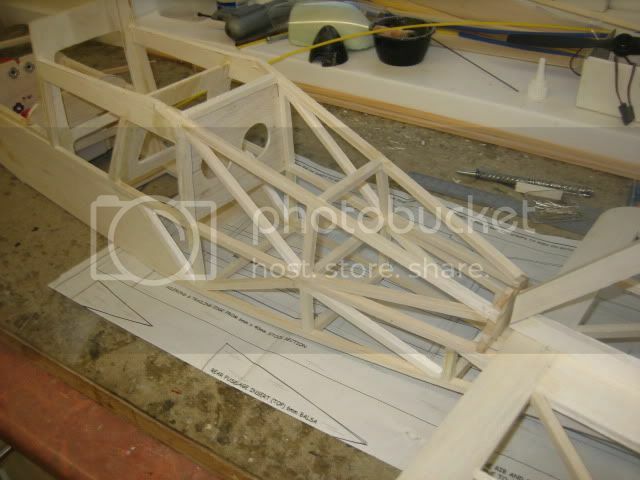 http://www.balsacabin.co.uk/ but of course try to support your local model shop if they stock balsa & ply. I would always use spruce for spars rather than balsa. piano wire for tailwheel 16 swg ? Buy an extra sheet of each if you expect to make mistakes, and dont blame me if the list is wrong! Good luck. Reading the text has revealed that the u/c is made from 10 SWG piano wire not 8 as I suggested. Also you need some beech for u/c. This is not at all clear on the plan. There is no shape shown for the piano wire. 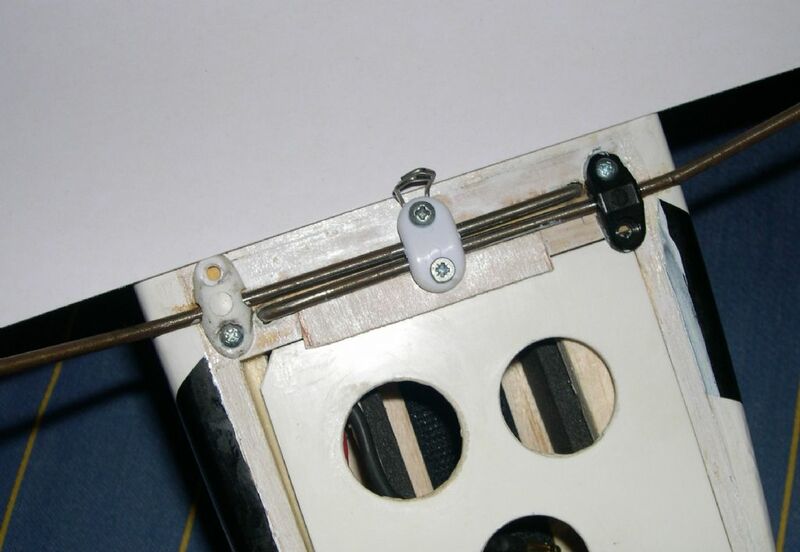 A tailwheel bracket is shown in a photo and these can be bought with ready bent wire and soldered on wheel too. But if flying from grass I would use a tailskid as used on all Peter Miller plans recently. Buy a razor plane if you do not have one already ( about 4 pound from Balsa Cabin ) as it will come in handy for the trailing edge and wing ribs. Gents your comments have been noted, my wrist has been slapped for not including such data, any future plans will do so, at least from me. Note to self thats just set myself up good style! I use a Slec balsa strip cutter for all the strip section to cut down to 6mm square, this is cheaper and more economical. Quantities are approximate. If 4" wide sheet not available 3" would do but you may need to glue pieces together for the fuselage sides. 15 articles Well done Lindsay - great example of the positive power of the forum . nearly got it finished for 30 fs power. Could not work out your F5 and the roof structure so this is my version,looks ok,just about to start the wings. The u/c is not clearly shown on the plan. Perhaps Lindsay could post a clear drawing. Presumably the 1/4 sq is removed where the beech blocks are located and not as hown on plan. Also the u/c would normally go outside the ply plate ( and have plastic clamps ) not through it as shown! The magazine says 10swg but Lindsays list says 8 swg wire. The ailerons are about 8mm thick on the plan rather than the 6mm specified. Where do you get the TE from?. All these are small points to experienced builders but such things as torsion bar u/c are not obvious to others. i am fitting a ply plate just in front of F3 and fitting a commercial aluminium u/c. Trailing edge stock is readily available from your local model shop but if you have a razor plane its easy enough to plane it dpwn to shape. The wire u/c on the plan is straight but if you look at the finished model you will see the u/c is raked forward to prevent model nosing over. Jim, as you will see earlier today I said I was not building this model myself, I am just asking the awkward questions for the benefit of others who have not built from plans before! 6mm by 40mm Trailing edge does not seem standard ( in the Balsa Cabin list anyway ) so I asked where the designer gets it from. In fact the plan measures about 8mm thick on the ailerons. It seems obvious to me that its a torsion bar u/c that goes right across the fuselage width and goes into the block on the opposite side. But I thought a beginner might not realise this so I asked for clarification. Those of us who fly from grass find a torsion bar u/c is a bit more forgiving than an aluminium u/c Saves ripping it out on a bad landing.......you just bend them back to shape! I see what you mean,this is where the forum comes into its own,we can talk to the designer instead of trying to get inside his head. No. 1 U/C is from 10swg piano wire, not 8 as I said earlier sorry about that. To be honest have not yet checked over the published plan thoroughly as yet, work has got in the way a bit, but will over the next couple of days and try to clarify anything a bit hazy. 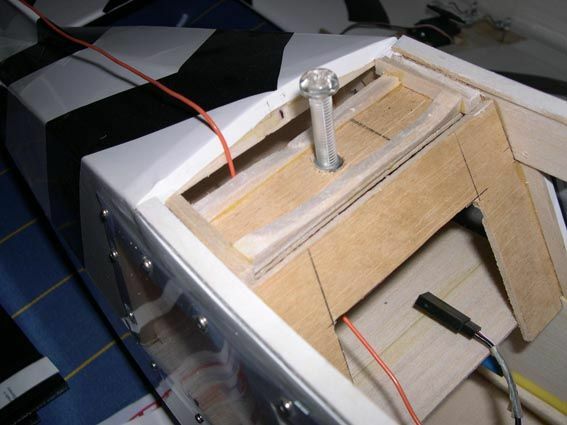 The U/C does span across the base of the fuselage and into a drilled hole on the opposite side so one leg is slightly further back than the other by the thickness of the wire. You could choose to fit a dural aluminium u/c but if flying from a rough site the wire is more compliant although this model will land extremely slowly. 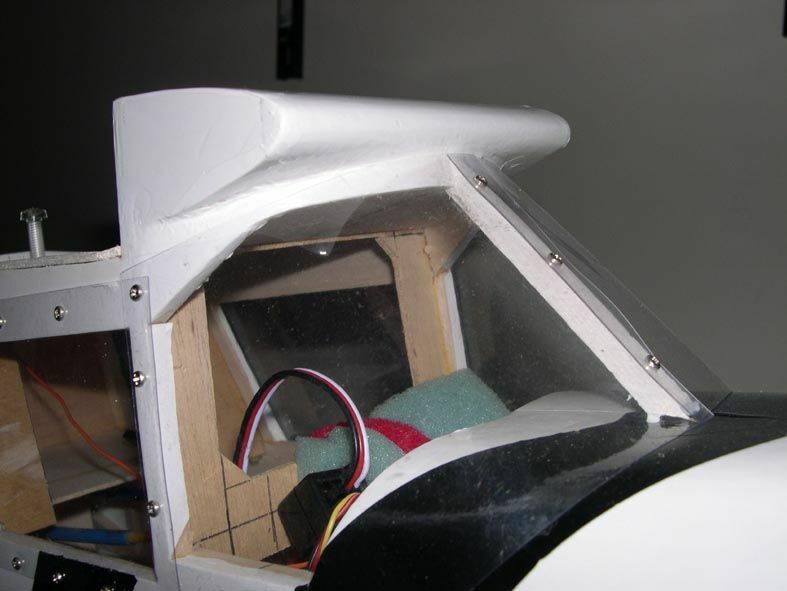 The roof structure is made from 2 x 6mm square glued together running down the centre, then further 6mm square glued at 90 degrees running to the fuselage sides at several points each side, these are then sanded from centre to the fuz edge to create an angled roof profile. Basically Jim your just lacking the tapered top. Don't worry its purley cosmetic and will not efect the performance. Should go really well on the 30FS. All my balsa stock comes from my local model shop, in my case Steve Webb Models. As I said earlier the wood sizes are working from memory but I will take some more photos of the model and post if this would help anyone. Thanks for the info,when you check out the plan please tell me if F5 is correct because it looks way too small to achieve a nice taper towards the rear fuz. I'll get the roof profile when I add the top stringer,I might have to modify the fin fairing as I have F6 slightly out of position according to the plan,The old grey cells need a boost now and then. It looks to me as if F4 is wrong not F5. On the plan view the top of F4 is 90 mm while the former is drawn as 96.5mm As it slopes back fore and aft, it needs to be 90mm. at the top . F5 looks OK to me. So it same story with plans that are re-drawn by someone other than the designer........they make mistakes by exactly 1/4 inch ( or 6.5 mm ) I have seen this in so many of the free plans its the first thing I do is to measure the formers and the positions of the notches etc. Nobody seems to check these plans before publishing them! Just needs 10 minutes to check these measurements and that everything is shown BEFORE printing! Well spotted my man,I made a new F5 former to fit under the 6mm wing supports as the original one was a mile away,as you say it makes the sides look vertical but a man on a galloping horse will never know the difference. The elevator is still 6mm to match the tailplane structure but the ailerons need to be 10 mm or 3/8" in old money as the TE of the wing has 1/6" sheet either side of the 1/4" square TE..
Much more fun having sleepless nights wondering how to put the mistakes right. Bet she will still fly mighty fine. I think 8mm is correct for aileron stock because the 1/4 inch SQ is chamfered to match the airfoil shape. I also noticed that the dotted wing rib cut line for R1 and R1a is shown too far back. It should be 3mm behind the spars ( not 6mm ) to allow for the 3mm spar brace in my opinion. I think the magazine should publish these amendments. Errors of 9 , 10 and also 12 mm in the width of the formers is not just a minor error. Surely someone should build from from the very plan that is to be published or at least check it over BEFORE publishing! It is very annoying to build from a plan and find out too late that there are errors in the former sizes. Very easy to spot these errors if you look & if you are an experienced plan builder, but not easy to newcomers. Guys i have just purchased the magazine with the plans for the zulu ET in it,in hopes of building one with my grand daughter. Is it going to be possible for me to build this thing, with the plans and the information contained here???? I have it nearly finished and I have been building for nearly 40 yrs. and I found it --- Challenging for the want of a better word ,the plan certainly needs checking out and reprinted. KC has identfied a few problems and it depends on your powers of interpretation and experience,I have enjoyed the challenge ,my way of doing things in a situation like this is if a part dont fit make one that will. I am fitting a 30 fs in mine so a little modification is required and this keeps the old grey cells in order.